Check out these new and used Brownie McGhee vinyl records LPs for sale. Brownie McGhee was born in Tennessee in 1915. He contracted Polio when he was four years old which affected his right leg. Brownie spent much of his youth making music singing with a local vocal group while he taught himself to play guitar. A surgery paid for by the March of Dimes allowed him to walk again. He became a traveling musician at age 22 and became good friends with Blind Boy Fuller. In fact, after Fuller died at an early age, Columbia Records promoted Brownie as Blind Boy Fuller #2. His real success came after moving to New York City in 1942 and teaming up with Sonny Terry. The two of them ended up recording and touring together until 1980. Brownie started acting later in life, and his most notable appearance was in the Steve Martin movie The Jerk. McGhee died of stomach cancer in 1996 at the age of 80. 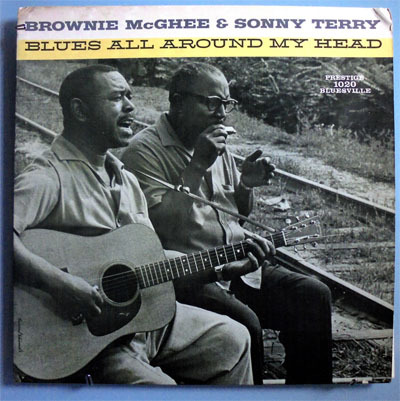 We recommend starting your Brownie McGhee vinyl collection with Around My Head (with Sonny Terry) from 1962. Our inventory is constantly changing, so check back often, or browse our list of vinyl from blues musicians.